Civil Rights (b/w) : GV young African American man seated at library table studying, Caucasian police officers stand above him staring down as the student ignores the police presence & continues reading. MS young African American men seated at diner counter, Caucasian police officers stand behind them, verbally removing them from the "white only" establishment. GV intersection of Capitol Street in Jackson, bus drives by camera. MS small group of young African American men & women being removed from building entrance by police. GV pan police car driving down Capitol Street. GV pedestrians walking past shops. 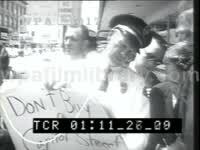 MS police officer surrounded by young Caucasian men as he holds place card read "Don't Buy Capitol Street". Capitol Street (color): Capitol Journal host HODDING CARTER standing at intersection as vehicular traffic passes in BG. Civil Rights (b/w): LS people lining Capitol St. as protest march moves toward them. Aerial pan massive group of protesters marching down center of Capitol St.